Starz has released the new official trailer for the highly anticipated third season of its Original Series Outlander, premiering on Sunday, September 10th at 8PM ET/PT. Fans now get a closer look at new footage from the forthcoming season based on Voyager, the third of eight books in Diana Gabaldon's international best-selling Outlander series. This new footage teases how both Claire and Sam are torn apart, and how their lives may never be the same again. Outlander Season 3 picks up right after Claire (Caitriona Balfe) travels through the stones to return to her life in 1948. 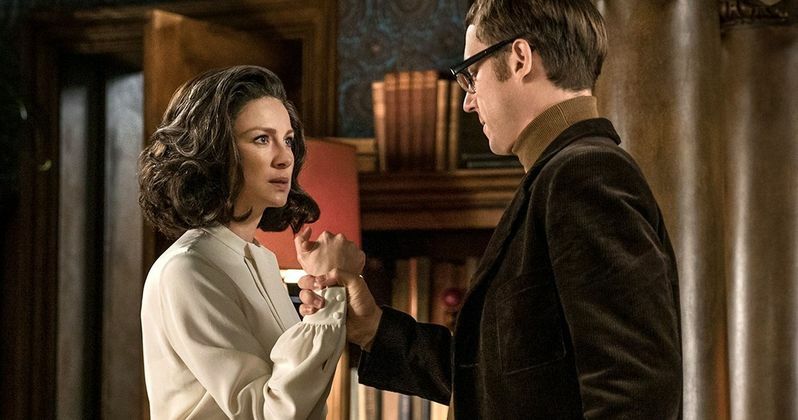 Now pregnant with Jamie's (Sam Heughan) child, she struggles with the fallout of her sudden reappearance and its effect on her marriage to her first husband, Frank (Tobias Menzies). Meanwhile, in the 18th century, Jamie suffers from the aftermath of his doomed last stand at the historic battle of Culloden, as well as the loss of Claire. As the years pass, Jamie and Claire attempt to make a life apart from one another, each haunted by the memory of their lost love. The budding possibility that Claire can return to Jamie in the past breathes new hope into Claire's heart... as well as new doubt. Separated by continents and centuries, Claire and Jamie must find their way back to each other. As always, adversity, mystery, and adventure await them on the path to reunion. And the question remains: When they find each other, will they be the same people who parted at the standing stones, all those years ago? Diana Gabaldon's eight-book Outlander series has sold more than 28 million copies worldwide and all the books have graced the New York Times best-sellers list. The Outlander series spans the genres of history, science fiction, romance and adventure in one amazing tale. The second season of Outlander won the Critics' Choice Award for Most Bingeworthy Show, and four People's Choice Awards, including Favorite TV Show. The Starz series will also be heading to Comic-Con 2017 later this week. The Starz Outlander Season 3 panel in Ballroom 20 at 5:00 PM will be moderated by actress and dancer Jenna Dewan Tatum. Panelists include Ronald D. Moore (executive producer), Maril Davis (executive producer), Diana Gabaldon (author), Caitriona Balfe (Claire Randall Fraser), Sam Heughan (Jamie Fraser), Tobias Menzies (Black Jack Randall/Frank Randall), Sophie Skelton (Brianna Randall) and Richard Rankin (Roger Wakefield). The autograph signing session will take place in the Starz booth #4029 on Saturday, July 22nd (time TBA). Fans who visit the Starz booth on Thursday and Friday can enter a raffle for a chance to win a spot at the Saturday signing. Ronald D. Moore, Maril Davis, Matthew B. Roberts, Toni Graphia, Anne Kenney and Andy Harries serve as executive producers of Outlander, which is produced by Tall Ship Productions, Story Mining & Supply Company and Left Bank Pictures in association with Sony Pictures Television. The marathon third season production filmed across ten months in its home base in Scotland, followed by Cape Town, South Africa, to shoot pivotal sea voyage scenes on the former sets of the STARZ original series Black Sails. Take a look at the new trailer for Outlander Season 3 below.